Topics: Cosmetic Dentistry, Dental Health, Bleaching, Crowns & Veneers, and Cosmetic Bonding. It is hosted by Lafayette Consolidated Government (Louisiana, Lafayette,) using Apache/2 web server. 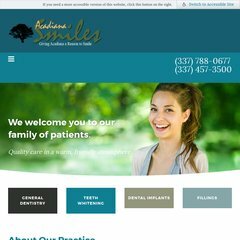 Acadianasmiles.com's IP address is 76.72.89.56. There are 2 Nameservers, dns-1.computerconcept.net, and dns-2.computerconcept.net.